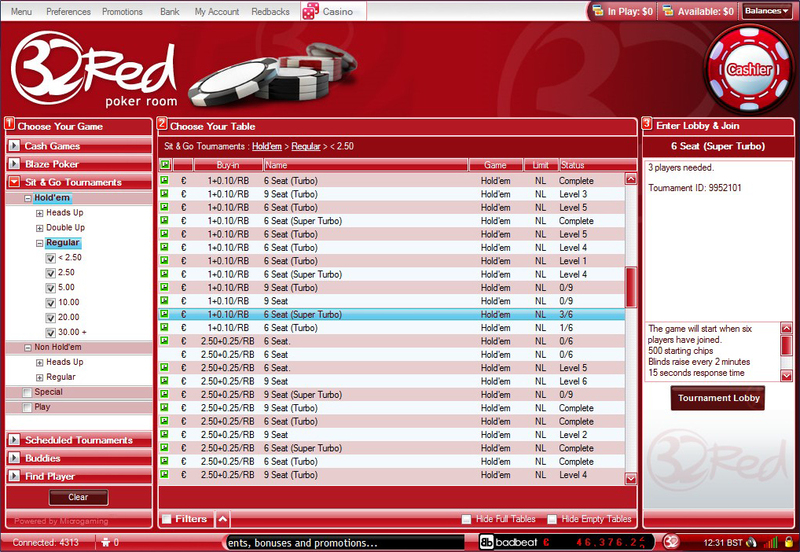 Established in 1995 and based in Gibraltar 32Red is a well respected and secure online poker site. As part of the Microgaming Network there’s a good amount of traffic 24/7 and their player base is one of the most loyal around. The software is stable and everything you need is easy to find and user friendly. They are upgrading and improving all the time, a recent addition is the Rabbit Cam feature where you can see the card that would have fallen if you had not folded and continued in the hand to the turn and river. They have also upgraded their tournament lobby where you can now choose between Filtered, Quickplay or the Standard lobby for those who prefer the traditional view. 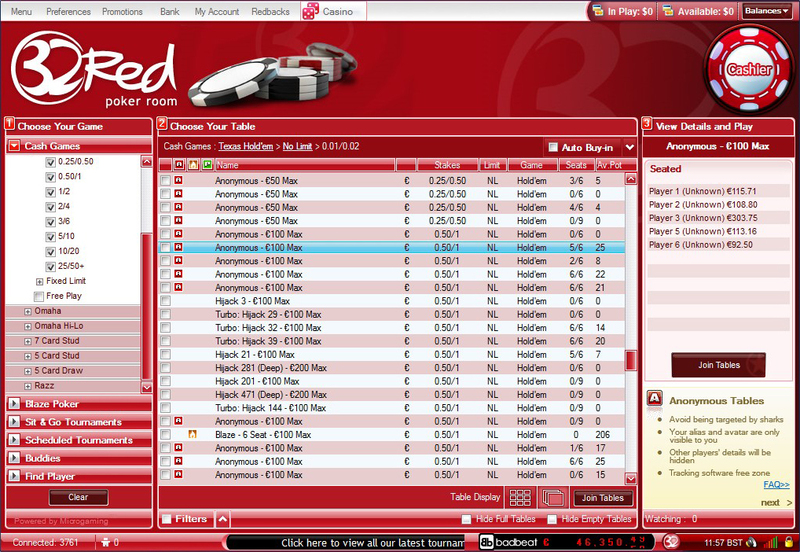 New to 32Red are Anonymous Tables – identified by a white A on a red background next to the table name in the lobby. 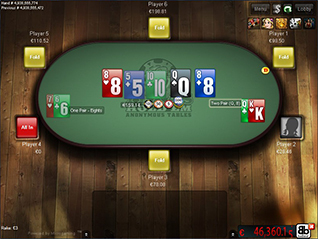 Anonymous tables mean that your opponents cannot track your game play or keep notes on you as you play with a temporary alias. These tables have become hugely popular and a real draw to the network. 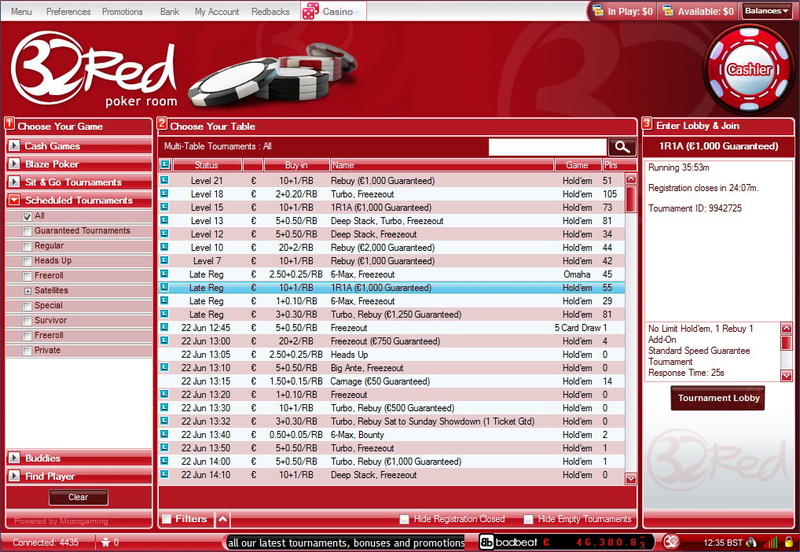 32Red has a very strong freeroll programme, when you join you will be invited to €3000 in new player freerolls. Don’t miss out on the monthly €1000 Depositor Freeroll held on the 1st Sunday of the month at 6pm UK for all players, new and old, who have deposited in the previous month. The welcome bonus is now up to $1000. In addition, when you join 32Red, you will be invited to play in €3000 worth of freerolls – 6 x new player €500 freerolls held on Wednesdays at 6.30pm UK. Further perks for newbies include a seat at 6 invitation only new player turbo tournaments each with an added prize pool of €500, join in the fun for only €1.10 on Wednesdays at 9.00pm UK. To take advantage of this sign up bonus of up to $1000 just collect the points issued, called Redbacks, as you play. For every $1 in rake or tournament fees you generate you will be awarded 30 Redbacks. You have 30 days after your first deposit, of at least $10, to earn Redbacks and then accept your reward which will range from $32 for 10,000 Redbacks earned to $1000 for 320,000 Redbacks earned. There’s a good amount of traffic at the lower stakes cash tables at 32Red, although you may have more trouble finding a game at the higher stakes. There’s also the option of participating in the Bad Beat Jackpot prize, get beaten with quad 8’s or higher and you and your fellow players at the table will all share in a Bad Beat Jackpot. Take your seat at one of the ‘progressive bad beat’ tables and you’re in with a chance. If you want to be guaranteed games at a poker variation other than Texas Holdem, you’d probably be better going to one of the larger online poker sites. Blaze is the brand new, exciting, way to play poker and it’s fast and furious! There’s no time wasting with Blaze use the quick fold button when you’ve had enough and you’ll find yourself with a new hand and sat at a new table. You can even multitable which means more speedy action. 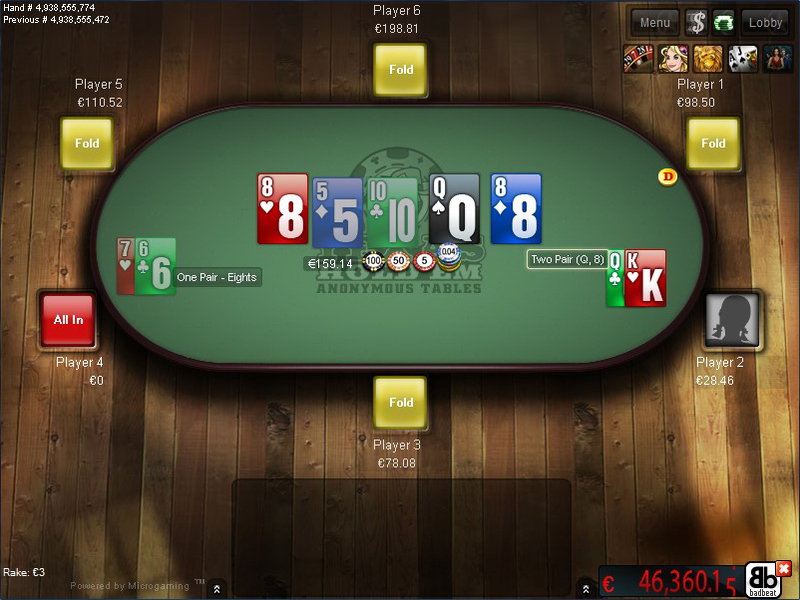 Find Blaze tables easily under the cash games tab. 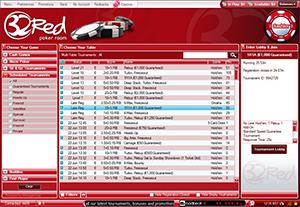 There are plenty of tournaments at buy-in levels to suit most poker players at 32Red. The guaranteed tournaments are certainly one of the biggest draws to 32Red, they run regularly all week with generous prizepools. Every quarter year there’s the larger than life €500,000 Guaranteed with a buy in direct of €550, the first Sunday in the month hoststhe €200,000 guaranteed with a buy in of €320. On the other Sundays there’s the Sunday €100,000 Guaranteed at the Euro friendly time of 7.00pm UK (2.00pm New York), you can enter directly for €110. There are satellites running 24/7 for all these guaranteed tournies from just €3 or, why not use your RedBacks to buy in? There are top sit n go tournaments at 32Red including double up games, progressive jackpots, steps and heads up. 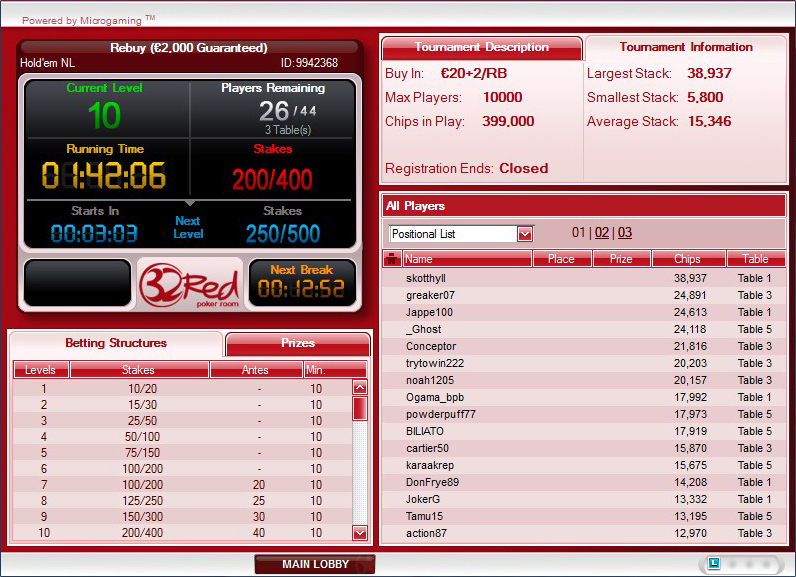 32Red give their players 30% rakeback everytime they play! 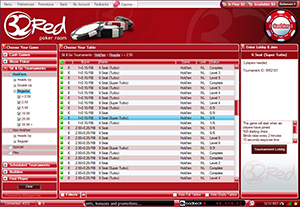 This is how it works: every time you play at a real money tables at 32Red Poker you earn Redbacks (loyalty points) at a rate of 30 Redbacks for every $1 in rake or tournament fees you generate. These Redbacks are converted into real money chips at a rate of 1 Redback = $0.01 (so 1000 Redbacks = $10) and then credited to your poker account – instantly! Voila, 30% rake back! You can also use your Redbacks to buy into selected tournaments – indicated RB in the lobby. Check how many Redbacks you have by accessing the 32Red lobby, they are displayed on the top bar. WiseGuys Leaderboards are back and are better than ever before, there’s €25,000 in free chips every month for winners of cash games, sit n go’s and tournaments. The cash leaderboard winners are rewarded daily, sit n go winners weekly and multi table tournament players monthly. Check your progress as you climb the hourly updated leader board on the website. Withdrawals normally processed within 7 days. There’s live chat 24 / 7, if you need any help, available via the website. 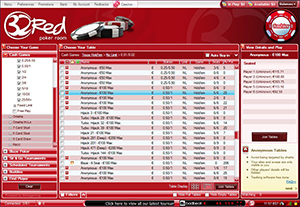 32Red Poker last reviewed by DirectoryOnlinePoker.com April 2019. All rights reserved.